Kids ages 12 and under are invited to receive one free piece of fruit per visit when they become a Co+op Kid at the East End Food Co-op! Selections may vary based on seasonality, but will primarily consist of organic, fair trade bananas. Co-op Membership is not required to enroll in Co+op Kids. To become a card-carrying Co+op Kid, children simply need to bring a parent or supervising adult to the customer service desk to sign up. Each child will be issued their very own super official Co+op Kids card! Kids and their parents/guardians stop by the designated Co+op Kids fruit basket in the Produce Department. In the basket, you’ll find that day’s free fruit selection and a small basket of stickers. Take a sticker and put it on your shirt. This helps our staff know you’re participating in the Co+op Kids program. 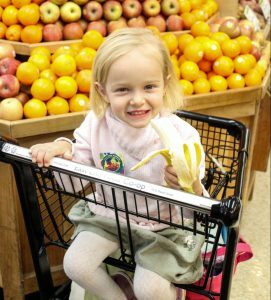 Each child is eligible to take one piece of fruit and enjoy it while shopping. What should you do when you’re done with your fruit? Peels and cores can be composted at the bin in the Café seating area. If you don’t see it, just ask a staff member. When you check out, please present your Co+op Kids card. 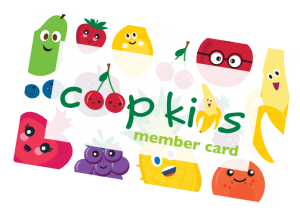 If you forgot your card, please just remind the cashier that you ate a free piece of fruit as part of Co+op Kids so that we can track participation in the program. That’s all there is to it! We hope the Co+op Kids program will engage your little ones in a fun shopping experience while promoting healthy eating habits. Co+op Membership is not required to enroll in the Co+op Kids program.